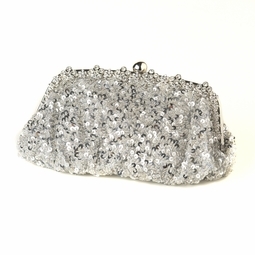 Description: This fabulous silver sequined clutch with intricate black beading is an absolute must have piece! Silver plated floral detailing encrusted with clear rhinestones truly makes this a unique embellishment and adds a sparkling touch! Wear this with your perfect evening ensemble to match and you'll be sure to have the most glamorous accessory!